Advocate for cats prevents parasite infections, fleas, heartworm, gastrointestinal worms, mites and lice. Does this get rid of Tapeworms? Hi Advocate doesn't treat tapeworms. 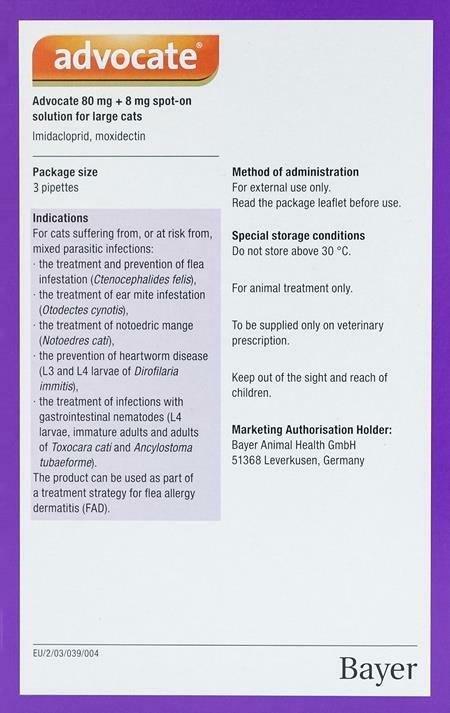 You may use it with profender spot on if you think your cat is under risk of getting tapeworm. I love this product for helping to control fleas, ear mites, and worms. However, I have to supplement in the summer in order to prevent ticks attaching to my cats. I understand that it must be difficult to have everything in one product, but that is the whole story.